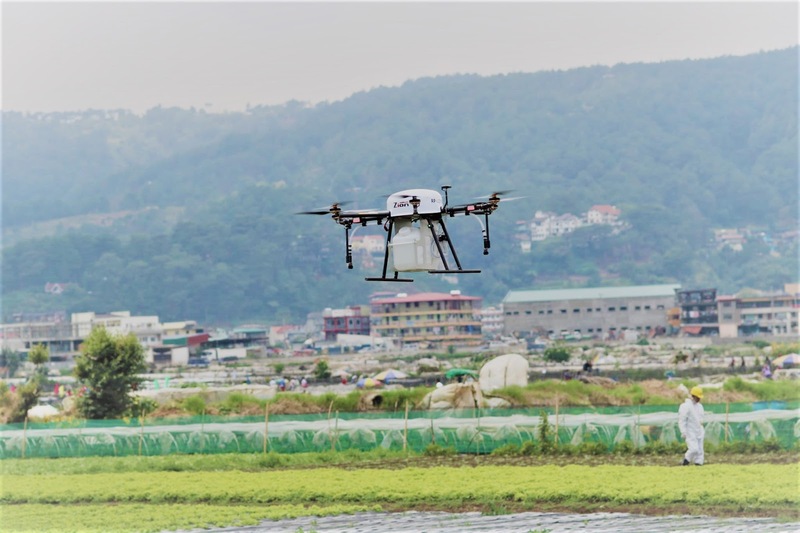 Cordillera - Benguet farmers will soon get into using cutting edge technology such as areal drones when it comes to spraying their crops as the Department of Agriculture (DA) successfully tested a remote-controlled drones which is capable of spraying vegetables from above. According to DA Secretary Manny Piñol five thousand hectares of vegetable farms in Buguias town and other selected towns of Benguet Province will serve as the pilot area of the newest farming technology which the department of Agriculture is adopting. 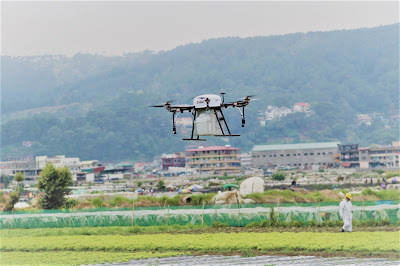 The areal spraying drone was tested in vegetable farms in La-Trinidad witnessed by the Japanese Embassy and the Japan International Cooperation Agency (JICA) officials, Benguet Governor Cresencio Pacalso and some curious vegetables farmers. DA Sec. Piñol said the use of drone technology in farm operation will be the fist time the Department is utilizing. He also said the farms in the Cordillera Region is ideal for the said technology because most of these are carved out of the mountains and the task of going up and down to spray the crops is costly to farmers. Agricultural drone technology has been improving in the last few years and many farmers are ready to adopt the use of it in improving their farm productivity. Drone applications in farming can range from surveying and mapping to cropdusting and spraying. Areal Spraying Drones can carry tanks of fertilizers and pesticides in order to spray crops located in higher elevated slope where traditional spraying method is hard to operate. The use of areal drones can also protect the farmers who spray crops manually from the risk of potential pesticide exposure. 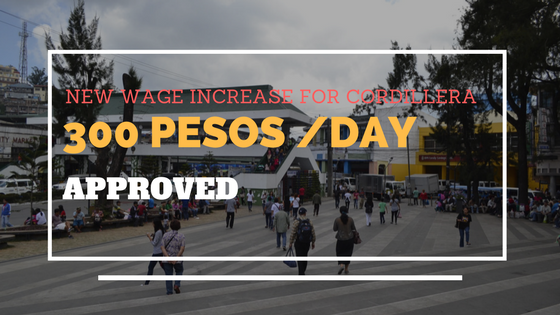 Cordillera - The Department of Labor and Employment - Cordillera (DOLE-CAR) had announced that there will be around 14,300 jobs available for those who are looking for employment whether local or overseas employment on May 1, during the celebration of Labor Day. 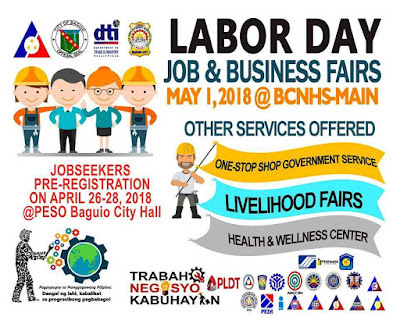 DOLE-CAR Director Exequiel De Guzman said that there are 12,300 overseas jobs and 2,370 local jobs available during the job fair which will be held at Baguio City High School main campus. De Guzman, in an interview with local media, urged jobseekers to avail themselves of the pre-registration service to prepare them in advance to know which employer or job should they apply. 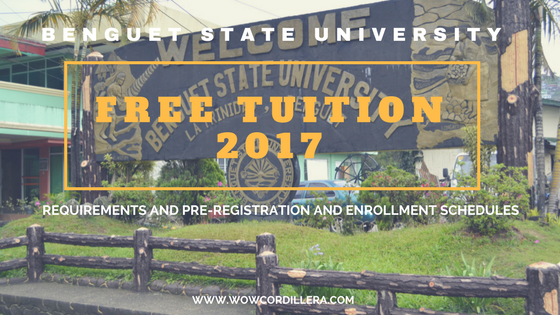 Venue of the pre-registration is at the Public Employment Service Office (PESO) located at the 2nd Floor of the Baguio City Hall from 8:00 am to 5 pm from April 26 - 28. De Guzman also raised hopes that many jobseekers will be hired on the spot which he believes will prove the success of the job fair. He also asked jobseekers not to be selective when applying for a job instead they should try to apply to several employers as much as possible. They should bring more of their job application requirements. 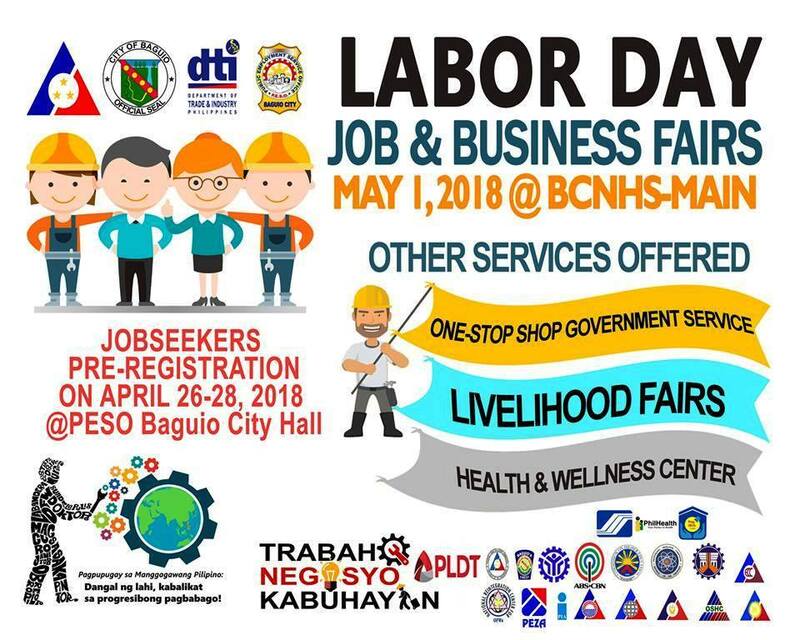 In addition to the job fair, De Guzman also said there will be seminars to be conducted to help Small and Medium Enterprise (SME) entrepreneurs to be spearheaded by participating government agencies. Baguio City - The Cordillera Administrative Region (CAR) has recorded the fastest among the 17 Philippines region in 2017 in terms of economic growth, the Philippine Statistic Authority (PSA) said. According to a data from the PSA, CAR showed a growth of 12.1 percent last year in terms of economic expansion. 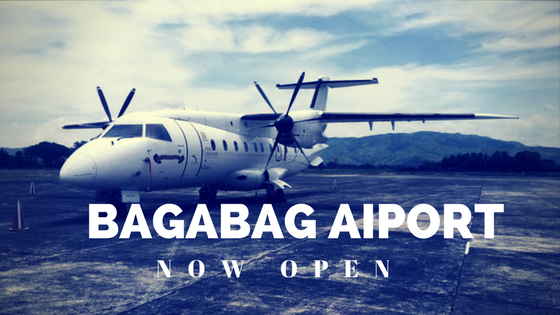 Main contributor of the positive growth are the provinces of Abra, Apayao, Benguet, Kalinga, Ifugao, Mountain Province including Baguio City. In a news published by BusinessWorld on Friday, it says the CAR's growing economy last year was lifted by the industry sector which is the region's main source of revenue output accounting for 52.1% of its gross regional domestic product (GRDP). Another driver to the growth last year was the infrastructure development, according the Union Bank of the Philippines chief economist Ruben Carlo O. Asuncion. "Current trends indicate that real estate developments are growing in non-traditional economic centers," Asuncion said. Asuncion also added that CAR and Central Luzon are host of recent game-changing infrastructure projects like the SCTEX (Subic-Clark-Tarlac Expressway), NLEX(North Luzon Expressway), and TPLEX (Tarlac-Pangasinan-La Union Expressway), which he believes have direct impact on local economies. Baguio Among Top 10 of Southeast Asia's Safest City. 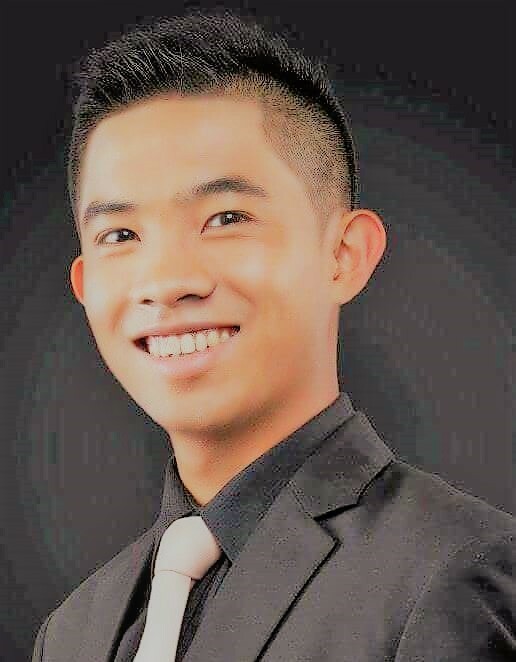 Cordillera - A student of San Beda - Manila, Algie Kwillon Mariacos, is among the top 10 of the 2017 Bar examination passers with a grade of 88.90 percent. Algie Kwillon Mariacos is from Bakun, Benguet. He was number 8 of the top 10 in the 2017 Bar examination together with Krizza Alcantara-Bagni, having the same grade of 88.90% . 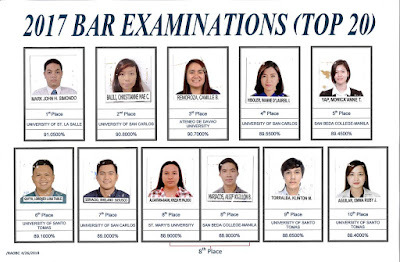 The results of the 2017 Bar examinations were released on Thursday, with Simondo, Mark John of the University of St. La Salle taking the top spot with a grade of 91.05 percent. 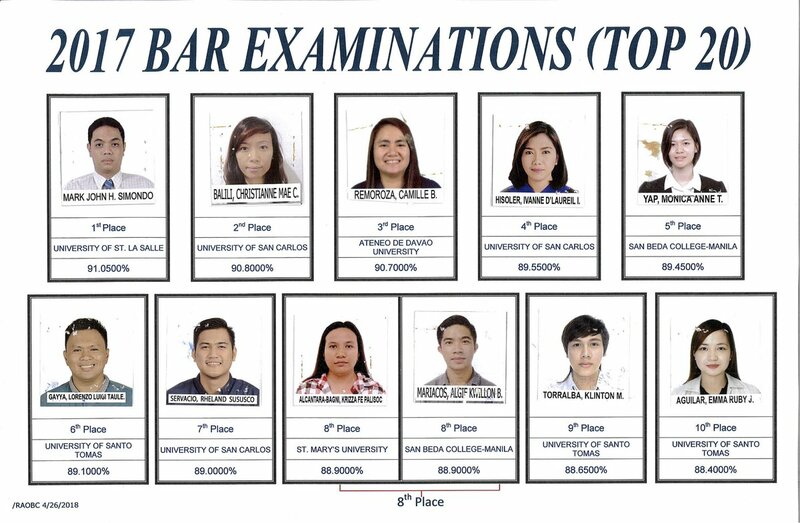 Committee Chairman Associate Justice Lucas Bersamin announced the results together with the copy of the list of successful examinees of the 116th bar exam held in November last year. The supreme court announced that only 1,724 of the 6,728 examiness had successfully passed the bar. Kulas posed for a photo along a road going to Kalinga overlooking a spectacular mountain view. 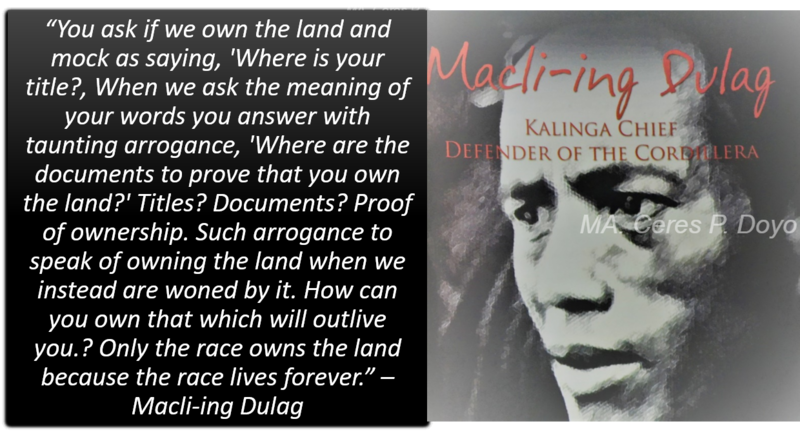 Photo Courtesy || BecomingFilipino FB page. Cordillera - A triumphant and memorable journey from the south all the way to the north passing through seas and mountains, Kyle Jennerman or popularly known as 'Kulas' had successfully concluded his road adventure in Batanes using his motorcycle he named 'Cindy'. When he arrived in Batanes, he was met by Rated K TV crew and conduct a short interview about his journey. Asked about his top 5 most memorable places in the Philippines, Sagada and Kalinga are his top one pick. The reason - the views of Sagada and Kalinga are incredible. "We literally drove from Manila up to Sagada and then Sagada to Kalinga. 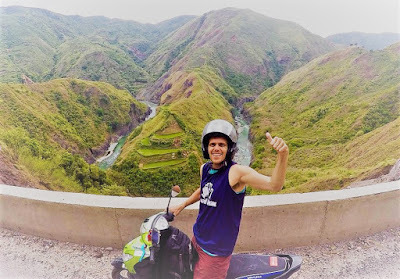 Sobrang malaki ang mountains, crazy roads but the views are incredible", Kulas said. 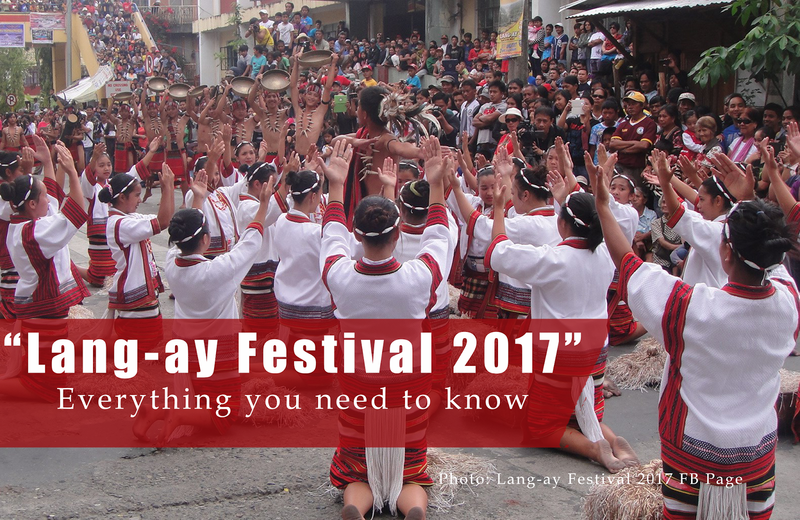 In his travel diary in his BecomingFilipino Facebook Page, he shared what he learned about the Apayao Province. 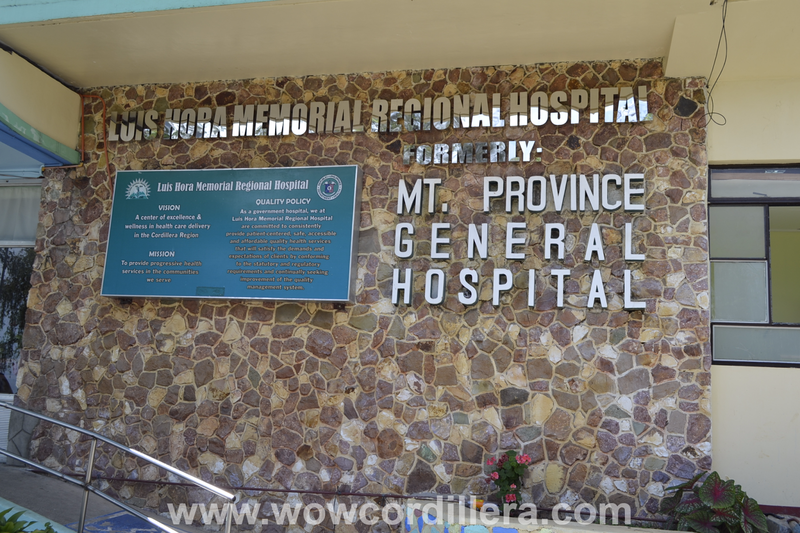 "Driving trough Cagayan Valley, I realized I was near the Provincial Capital of Apayao. So, I decided to take a little detour. Even though I haven't explore the Province, it was great to learn a little and better understand just how big and diverse Luzon is! Did you know that Apayao is only 23 years old, and split from "Kaling-Apayao". It was such as beautiful simple experience outside the Capital, and without a doubt it made me realize..in the future I MUST explore this Province in the mountains." Staying in Sagada is an incredible experience for Kulas. The cool temperatures and natural climate, the delicious local brewed coffee and Blueberries and the hospitality of the people, these are all the things Kulas will never forget about the town of Sagada. "Sagada, your environment is incredible, and you offer so many simple things that truly add comfort and happiness to days spent in your charming town", Kulas wrote in his FB page. 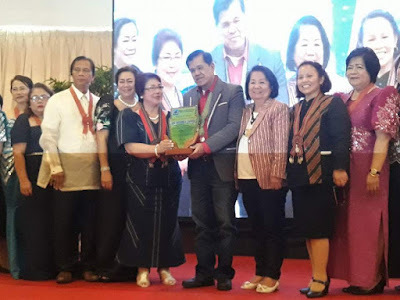 Cordillera - Mayor Materno Luspian of Mankayan, Benguet was conferred by the Association of Local Social Welfare and Development Officers of the Philippines, Incorporated (ALSWDOPI) as this year's Gawad Parangal Most Oustanding Mayor (1st to 3rd class municipality). The award was formally received by Luspian during 22nd LSWDO's National Development Forum and General Assembly held at Crown Legacy Hotel, Baguio City on18th of April 2018. The said award is given to local chief executives in the country who have excelled in the implementation of their social welfare and development programs. Luspian is among the 13 local chief executive chosen for the prestigious award including Baguio City Mayor Mauricio Domogan and other mayors and governors from different provinces and municipalities in the country. Among Luspian's notable policies is the strict implementation of the 'No Segregation, No Collection Policy' and waste segregation at source ordinance. The new ordinance prohibits littering or throwing of waste in public places, dumping of garbage in public and private areas, non-segregation of solid waste at source, unscheduled bringing out of waste, unauthorized dumping of solid waste at disposal facility (MRF), transport of solid waste without nets or covering materials on the collection vehicles, opening burning or solid wastes, and burning of agricultural wastes. The ordinance also stipulates the proper segregation of wastes before it will be brought out for collection otherwise it will not be collected. Failure to follow the ordinance will have fines and penalties ranging from P500 to P2,500 and one month imprisonment. Luspian was joined by Gawad Parangal 2018 Commitee Chairperson Florita Lachica and ALSWDOPI National President Betty Fangasan. 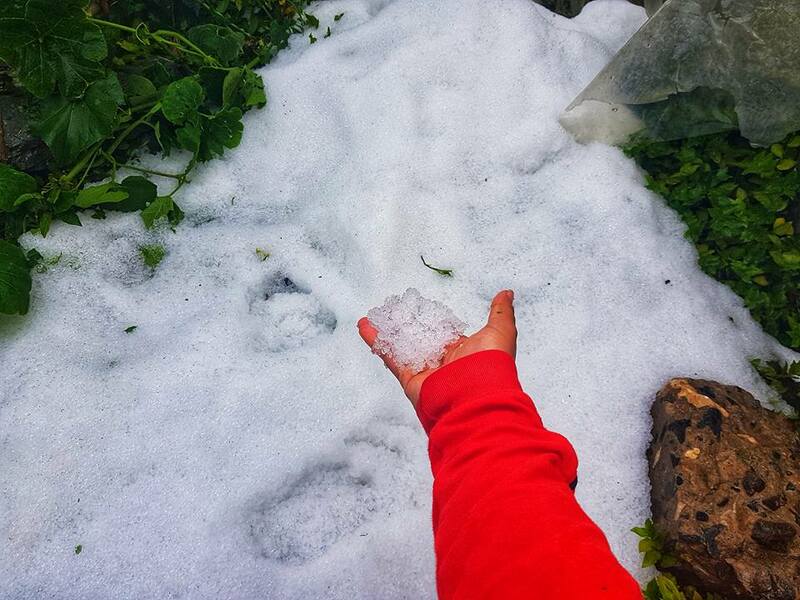 Baguio City - Pebbles of ice with the size of corn kernel showered the town of Paoay in Atok Benguet for over an hour on Saturday. In a short video uploaded by a local resident on Facebook, it can be seen the moment when corn kernel- size pebbles of ice land on roofing of a house overlooking a greenhouse garden below. 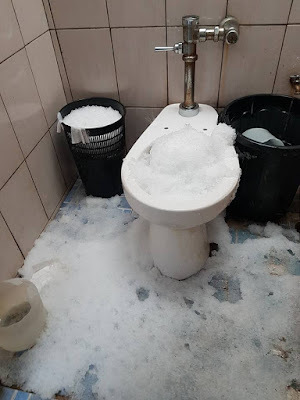 Video uploader Stefanie Cornel Haight also posted photos of the aftermath of the hailstorm that hit and filled a toilet bowl with small marbles of ice similar to crushed-ice used in Halo-halo. 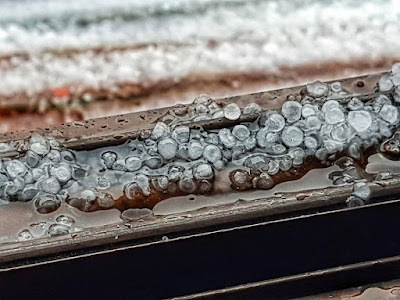 Occurrence of hailstorm during the beginning of the summer season in the country can only happen once or twice a year which can be attributed to the negative effects of climate change according to Philippine Atmospheric, Geophysical and Astronomical Services Administration or (PAGASA). But PAGASA had said that hailstorm such as this should not cause panic and fear, since it is simply a natural phenomenon that occurs when high temperature hit land, causing precipitation to fall to earth as rain but freeze on the way to the ground. Photos and Videos all belongs to Stefanie Cornel Haight. Cordillera - Igorots MMA fighters bring glory to the Philippines and Cordillera as they successfully won their individual battle in front of a cheerful hometown fans at the Mall of Asia Arena in Pasay City on Friday night. In the main event Kevin "The Silencer" Belingon from Kiangan Ifugao had delivered a brilliant performance as he pummeled Andrew Leone until the 2nd round, when he delivered a beautifully executed spinning side kick that brought Leone to the ground. Belingon then followed him with loads of hard blows that caused the referee to intervene to prevent more damages. Belingon scored a breathtaking TKO at 1:27 of round 2 improving his record to 18 wins and only 5 losses. Honorio "The Rock" Banario, another Igorot fighter from Benguet had impressed his hometown fans with a split decision victory over veteran fighter Adrian Pang. With his improved defense and perfectly executed kicks and punches, Banario was able to land numerous clean and hard shots against Pang that ultimately got the favor of the judges. Banario had improved his record to 13-6 with a five-bout winning streak. 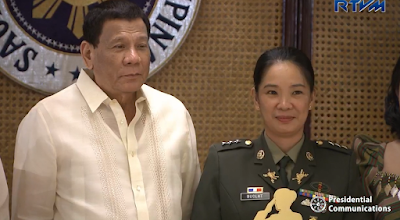 Also giving honor to the Philippines and the Cordillera is the only female Igorot fighter in the event, Gina "Conviction" Iniong who won via dominant unanimous decision against Jenny Huan. Baguio City - Three high school students have emerged winners in the recently concluded 8th ASEAN Quiz National Level Competition held in Quezon City from April 3 to 6. Among them was Jericho Villarico, a grade 10 student of Baguio City National High School who was declared the overall champion. Villarico said he felt pressured because after the result, the three of them will carry the flag of the Philippines when they will go to Indonesia for this year's 8th ASEAN Quiz Bee. "I feel more pressured because we have to carry the flag of the Philippines in the regional competition in Indonesia, because the Philippines has been consistently winning, " he said according to Philippine News Agency website. Villarico and his team will travel to Bali, Indonesia in the last quarter of this year for the 8th ASEAN Quiz Bee. The ASEAN QUIZ aims to foster the spirit of healthy competition among ASEAN youth in a friendly quiz that exposes them to ASEAN cultural, political, economic and social information. 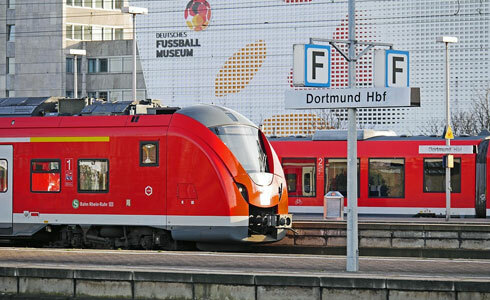 Student-participants also get a chance to immerse themselves in the culture of the host-country in a special day tour attached to the event. 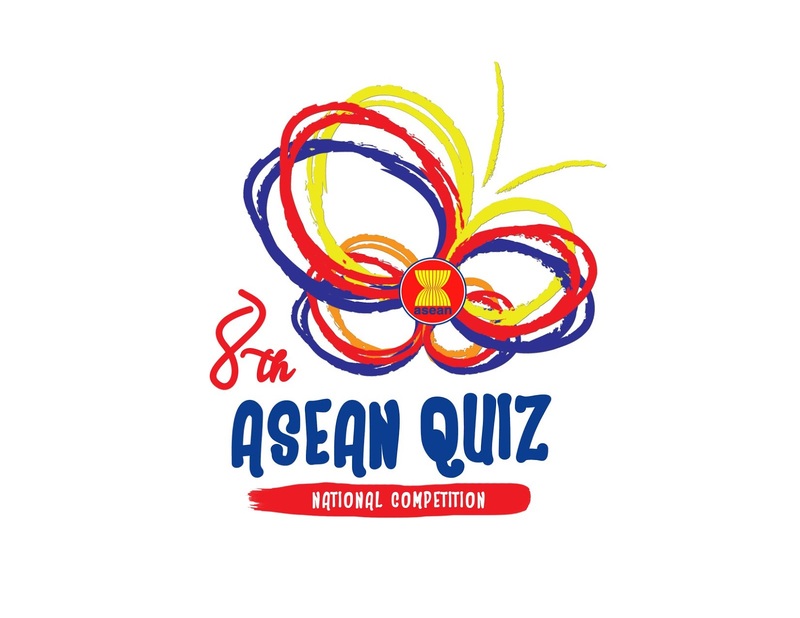 Meanwhile the ASEAN Quiz National Level Competition is a biennial contest held in the country which aimed to gather the brightest students nationwide to prepare them to compete in the regional level against students from the 10 ASEAN member countries. Cordillera - Baguio City has been named among the safest city in Southeast Asia according to a newly released data from Numbeo. Numbeo is the world's largest database of user contributed data about cities and countries worldwide. Baguio City has been ranked the 6th place with a record of 59.43 safety index. Aside from Baguio, there were other four cities of the Philippines that have been included in the list. 8th Place: Cebu City - 55.72 Safery Index.